Paige Grant ('70), left, with Sunaina Suneja ('75) in Santa Fe, New Mexico, April 2008. Read more from Sunaina. Peter Johnson('78), Nora Noe ('79) and Pieter Ravensburg ('78) rendezvoued in Haarlem, the Netherlands, in April of this year. Read more from Peter. 8 February 2008 - AES Alumni Dinner - New Delhi. l-r (standing) - Aloka Dalal ('74); Alka Bajaj (AES Receptionist); VJ Chandok ('76); Deepak Sen ('74); Bandana Sen (recently retired school Librarian); Uwe Bagnato (current AES High School Principal) l-r (seated) Dolly Suneja Narang ('71); Mrs Chaudhry (former AIS 3rd-grade teacher); Sunaina Suneja ('75). Read more. Class of 1976 dinner in Washington, DC, April 12. From left: Eryn Creedon, Ashok Nimgade, Tawnya Morden Harvey and Marshall King. Read more. Tina Thuermer, AIS class of 1969, thinks life is good. Read more from Tina. Tim Brown ('70) and Mary Flanagan Williamson ('74) in Washington, DC, in front of the White House, April 9, 2008. Judy Newberry ('69), Phyllis Keene ('69), Donna Newberry (school nurse '68 & '69) & Jim Newberry ('70), in Minden, NV, April 2008. "Here's a shot of Emmanual Tabarly (best friend and Fabian's younger bro) and me (on right) in 2006, striking our best Top Gun pose before a short flight around Philadelphia." Read more from Robert Nachtrieb. Andres Marin with daughters at home in Chile. Read more. Malcom Garg with his wife Indu and their children Nikki and Nathan. Read more from Malcolm. Read more from Alfred Poor. Joe Bettinger, AIS class of 1966, writes, "Fran and I are planning to attend the reunion in Reno--so put us on the list. It'll be good to see everyone again. We certainly had fun during the last reunion in Tahoe. This is a picture of Fran, my cousins, and myself, in Positano Italy recently. This is pretty much what we do all the time now." Dinner at KC Gray Siebert's home in Springfield, Virginia; February 5, 2008. Clockwise from lower left are Andy Campbell, Judy Newberry Ashley, Tim Brown, Ellen Turner, Allie Felder, Mary Williamson, Sue Ball Carew, KC Gray Siebert, Kitty Thuermer, Annie Rieger, Tim Moore. Above, Ellen Turner, Annie Rieger. Dan Rizzie and Jill Jonnes at dinner in Washington, January 2008. See who else was there now. Dinner in Walnut Creek, CA, January 2008. Couples, from left to right, are KC Gray Siebert and husband Neal, Mary Pomeroy Sheridan and husband Pat, Paul Rieger and wife Linda. The cat is unidentified. Richard Coorsh, AIS class of 1970, with Senator John McCain, October 2007. Read more from Richard. The Brown's celebrate New Year's 2008 in Bethesda, MD. From left are Susan Brown Wadleigh, AIS class of 1976, Dean Brown, Mary Brown, Priscilla Brown Lucas, AIS class of 1973, Nancy Brown Colvin, AIS class of 1974, and Tim Brown, AIS class of 1970. Best wishes for a healthy 2008! Phoebe Bradley, AIS class of 1974, above,recently completed a huge '76 foot long mural for The Copley Classroom @ the Lux Art Institute in Encinitas, California. See a panoramic view. Scott York and his sons Stephen (12) and Michael (10), Dec. 30th, enjoying a little basketball over the Holidays. Scott lives in Stafford Virginia, works for CACI (State Department) outside the DC Area. 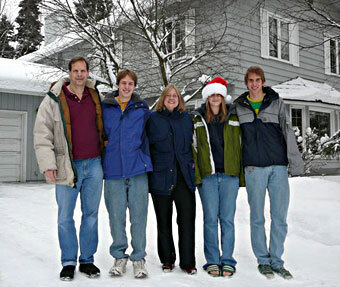 Leslie Hiebert, center, writes, "Here's a photo of my family outside our home in Anchorage. Best wishes from Alaska for a peaceful new year!" Susan Hiebert Harvey with her horse, Teddy and dog, Dusty, in Plumas County, California, 2007. Sue writes, "I help a local (Walnut Creek) rancher bring his cows in off Mt. Diablo every spring before the grass turns brown. Always an adventure!" Eve Drobot in Ireland in 2005. Read more from Eve. Joe Gallagher, AES class of 1990, with daughter Keyara. Read more from Joe. Suzanne Spooner-Munch, AIS class of 1969, and her husaband, Paul, in Canberra, Australia, October 2007. Read more from Suzanne. Axson Chalikulima, AES class of 1982, sends this photo and writes, "I am in Japan. I jumped the broom 6 years ago. I eat rew fish and rice every day. Peace out." ating from AIS in 1965. Read more from Betty. Left, Anna Maripuu, Class of 1982; on bench, Jan Davis and Sue Ball Carew. Read about the 2007 Picnic. Jesper Fr�tlund owns an IT company in Denmark. Read more. Majd Patou Fathallah, right, AIS class of 1975, with her mother & brother. Majd is a successful sculptress in London. Read more, and see samples of her work.